How does it feel to be the baker for a queen? 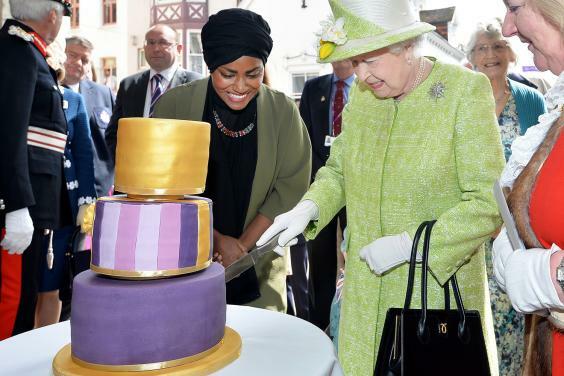 31-year old Nadiya Hussain would know, for it is she who baked the cake ordered for the 90th birthday celebrations of Queen Elizabeth II on April 21. Nadiya was commissioned by Buckingham Palace to bake the cake as part of the queen’s birthday celebrations. Hussain baked a three-tier orange drizzle cake with orange curd, orange butter cream and marmalade. Hussain’s cake, which was presented to The Queen live on television during her 90th birthday celebrations last week, was met with mixed review from the public on Twitter. “Disappointed with Nadiya’s cake.. Wonky, iced terribly and just plain boring. Not fit for the queen at all! #Queenat90,” wrote one person. Nadiya shot into fame last year when she won the sixth series of The Great British Bake Off, an immensely popular TV show on BBC. The final was watched by over 15 million viewers and made Nadiya a household name in UK with a large following on social media. Nadiya was born in Luton to migrants from Bangladesh who came to Britain seeking a better life. She attended Challney High School for Girls near her home, where she first discovered the joys of baking. She went on to Luton Sixth Form College, and in 2003 gained her A levels in English language, psychology and religious studies. At the time of The Great British Bake Off, she was a full-time mum living in Leeds with her husband and three children.